Search For Missing Argentine Sub No Longer A Rescue Mission, Navy Says : The Two-Way "More than double the number of days have passed where it would have been possible to rescue the crew," a navy spokesman said. "We will continue the search ... there will not be people saved." 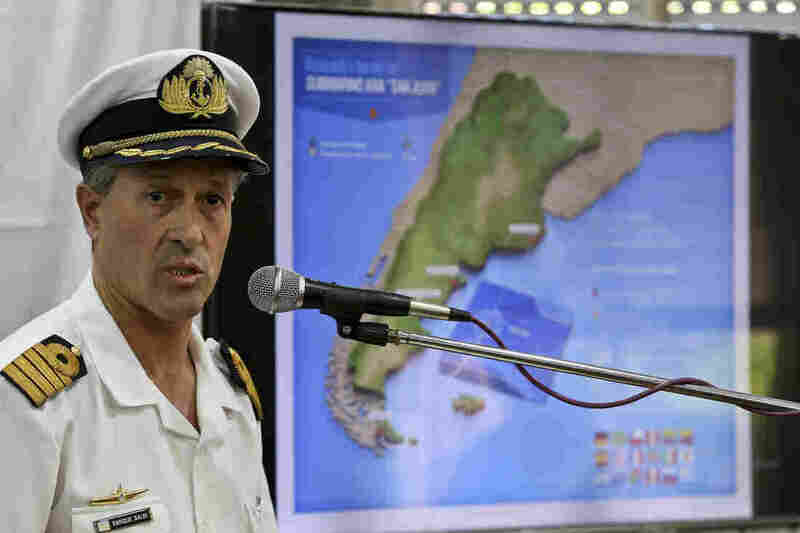 Argentine navy spokesman Enrique Balbi announced Thursday that searchers no longer expect to find survivors of the missing ARA San Juan submarine. Argentina's navy has announced that it is no longer looking for survivors on the submarine that disappeared more than two weeks ago but will continue to search for the missing ARA San Juan. "More than double the number of days have passed where it would have been possible to rescue the crew," navy spokesman Enrique Balbi told a news conference Thursday, according to Reuters. "We will continue the search ... there will not be people saved." The navy said that the search and rescue mission had involved 28 ships, nine aircraft, 4,000 people and support from 18 countries. "Despite the magnitude of these efforts, it has not been possible to locate the submarine," the navy said in its statement. The crew of the ARA San Juan included 43 men and one woman when communications were lost, the newspaper Clarín reports. Luis Tagliapietra, the father of one of the missing submariners, told cable channel TN that he was "destroyed" by the announcement. He said he had found out on television that the navy had moved on from its rescue phase. "It is cruel," Tagliapietra told the broadcaster. "I do not understand it. It is blow after blow. It's another lie. They promised us that they would look for them until they find them." The vessel set off from the Argentine city of Ushuaia on Nov. 13 and lost radio contact with the naval base in Mar del Plata on Nov. 15. Last week, the navy said that an explosion occurred near the San Juan's last known location. "[T]he vessel's captain reported that water entered the snorkel and caused one of the submarine's batteries to short circuit. The captain later communicated by satellite phone that the problem had been contained. "Some hours later, an explosion was detected near the time and place where the San Juan was last heard from. A navy spokesman said this week that the blast could have been triggered by a 'concentration of hydrogen' caused by the battery problem reported by the captain." The news service reports that the San Juan had been retrofitted in 2014, which involved cutting the vessel in half and replacing its engines and batteries. Argentine President Mauricio Macri has ordered an investigation into the vessel's disappearance. "The only thing I want is for my son to turn up," Hilda Raquel Colombani, the mother of one of the missing, told The New York Times. "If he's dead, I want his body so that we can carry out a proper Christian burial and to make sure he is not left in the bottom of the ocean forever." The Times notes that fatal submarine accidents are rare in peacetime, with the last major incident that of the Russian vessel Kursk, which sank in 2000 with 118 on board. A previous version of this story said the Kursk sank with 188 people onboard. The correct number was 118.